Note: the word Ananda means bliss in Sanskrit language and is quite often part of a Hindu monastic name. Ananda (Ch:阿難) was one of many principal disciples of the Buddha, a devout attendant and was renowned as the Guardian of the Dharma. Ananda was the first cousin of the Buddha, and was devotedly attached to him. Once he entered the Order in the second year of the Buddha’s ministry, he became one of his personal attendants, accompanying him on most of his wanderings and being the interlocutor in many of the recorded dialogues. He is the subject of a special panegyric delivered by the Buddha just before his death (Mahaparinibbana Sutta, Digha Nikaya 16); but it is the panegyric of an unselfish man, kindly, thoughtful for others and popular; not of the intellectual man, versed in the theory and practice of the Buddhist system of self-culture. So in the long list of the disciples given in the Anguttara (i. xiv.) where each of them is declared to be the chief in some gift, Ananda is mentioned five times (which is more often than any other), but it is as chief in conduct and in service to others and in power of memory, not in any of the intellectual powers so highly prized in the community. This explains why he had not attained to arahatship; and in the earliest account of the convocation said to have been held by five hundred of the principal disciples immediately after the Buddha’s death, he was the only one who was not an arahat (Cullavagga, book xi.). In later accounts this incident is explained away. Thirty-three verses ascribed to Ananda are preserved in a collection of lyrics by the principal male members of the order (Theragatha, 1017-1050). They show a gentle and reverent but simple spirit. Ananda is often called the disciple of the Buddha who «heard much»; because he attended personally upon the Buddha and often traveled with him, Ananda overheard and memorized many of the discourses delivered by the Buddha to various audiences. 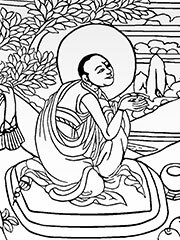 At the First Council, convened shortly after the death of the Buddha, Ananda was called upon to recite many of the discourses that later became the Sutta Pitaka of the Pāli Canon. Despite his long association and close proximity to the Buddha, Ananda is depicted as being slow to develop along the Buddhist path. Prior to the First Council, it was proposed that Ananda not be permitted to attend on the grounds that he was not yet an arhat. According to legend, this prompted Ananda to focus his efforts on the attainment of nibbana, and he was able to reach the specified level of attainment before the calling of the conclave. Ananda was, however, rebuked by the First Council for failing to request that the Buddha remain in the world for a longer period of time; in the Mahaparinibbana Sutta, the Buddha is depicted dropping a number of hints to Ananda that he can remain in the world as long as is required if it is requested by one of his disciples. Ananda fails to pick up on the intimation, and the Buddha soon after passes from the world. In contrast to most of the figures depicted in the Pāli Canon, Ananda is depicted as an imperfect, if sympathetic, figure. He mourns the deaths of both Sariputta, with whom he enjoyed a close friendship, and the Buddha. A verse of the Theragatha reveals his loneliness and isolation following the death of the Buddha. In the Zen tradition, Ananda is considered to be the second Indian patriarch. He is often depicted with the Buddha alongside Mahakashyapa, the first Indian patriarch.